Contrast: There Is A Child Born of Mary, words from the Hill Ms.
Also found in Edith Rickert, Ancient English Christmas Carols: 1400-1700 (London: Chatto & Windus, 1914), pp. 49-50. Why are ye so sore aghast? Veni, Creator Spiritus is translated as "Come, Creative Spirit"
O Lux Beata Trinitas is translated as "O blessed light of trinity." A solis ortus cardine is translated as "Arisen from the quarter of the sun." Iam ortus solis cardine is translated as "Now the star of light having risen." This Carol is of the time of Henry VI [1421-1471]. 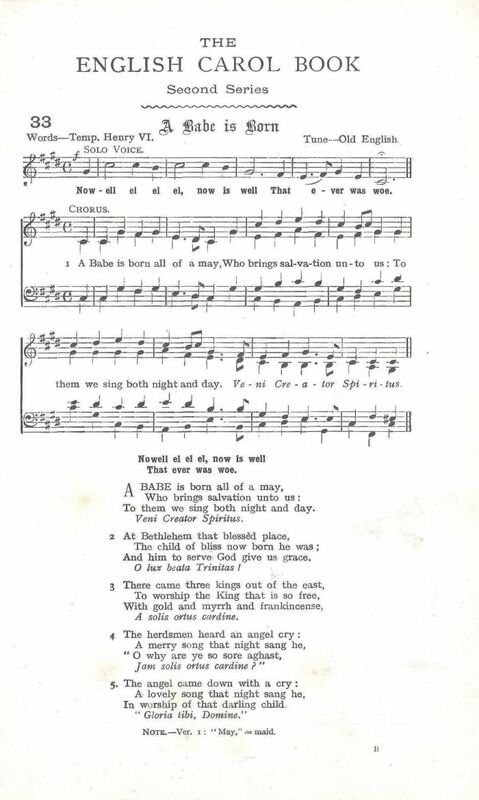 The Latin words with which each verse is terminated are the first lines of hymns used in the church service. This mode of writing was very prevalent amongst the mediæval carolists.